I thought this day would never come . . . My fireplace is done! 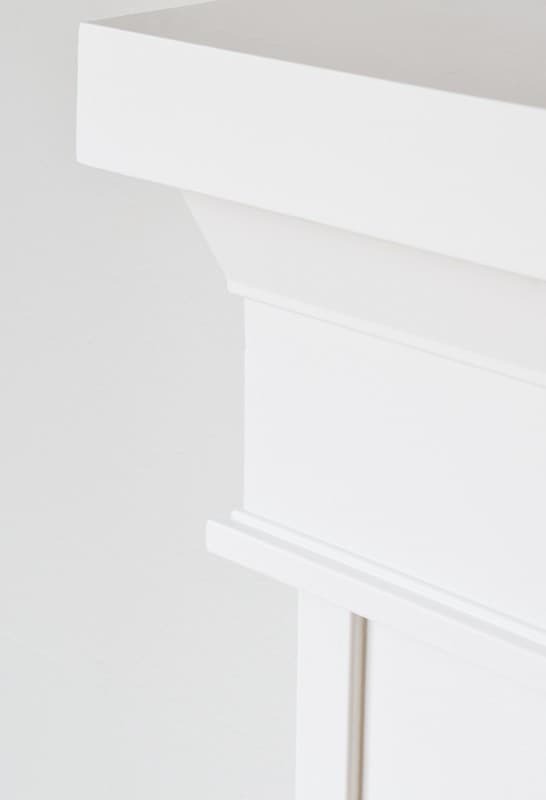 This week, I pulled it all together with gorgeous fireplace trim. 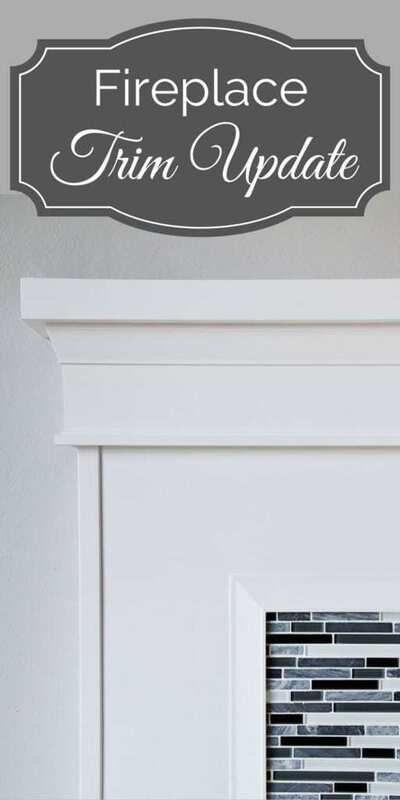 In case you missed it, you can find all the posts for my fireplace remodel series here. I chose these pieces before I even picked up the chisel and crowbar, so I’m really excited to see my vision finally come to life! This post is sponsored by Metrie. I was provided with the trim for this project at no cost, but all my opinions are my own. Please see my disclosures page for more information. 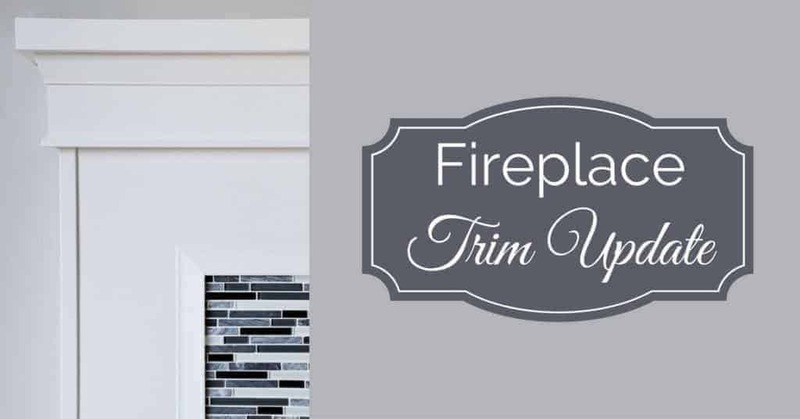 When I first started planning my fireplace remodel, I knew I wanted something special for the mouldings. I discovered Metrie’s Very Square line of interior finishings and knew it would be perfect for my project. The clean, modern lines add visual interest without being overly ornate. I was thrilled when Metrie agreed to provide me with the pieces I needed to complete my fireplace! But before I could install my beautiful fireplace trim, I had to do something about my wonky mantel. 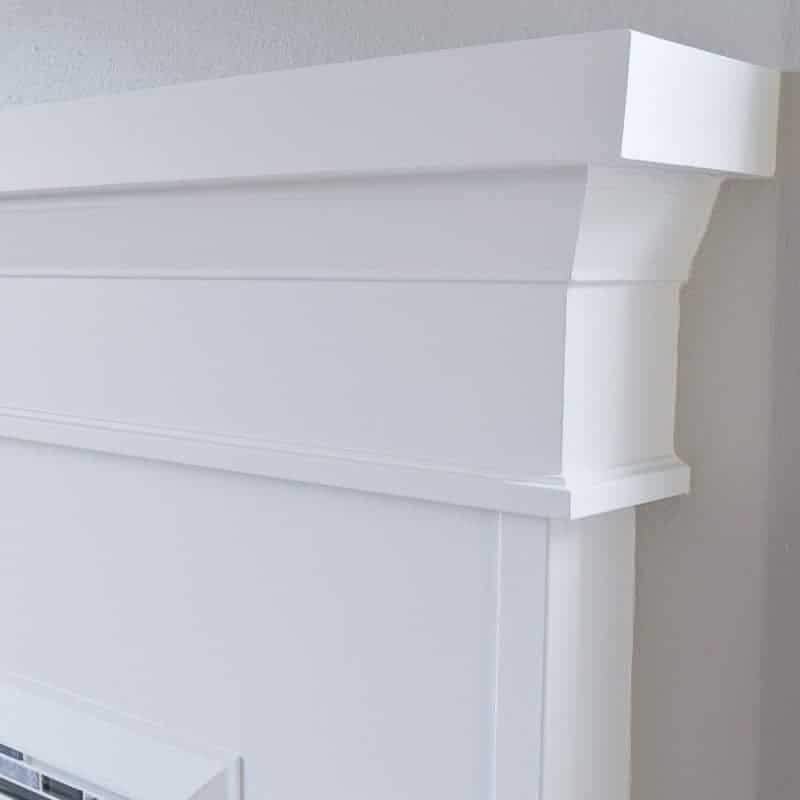 If you remember back to my original fireplace demolition post, the mantel is attached to the wall with brackets that were plastered over to create this unsightly bulge on each end. 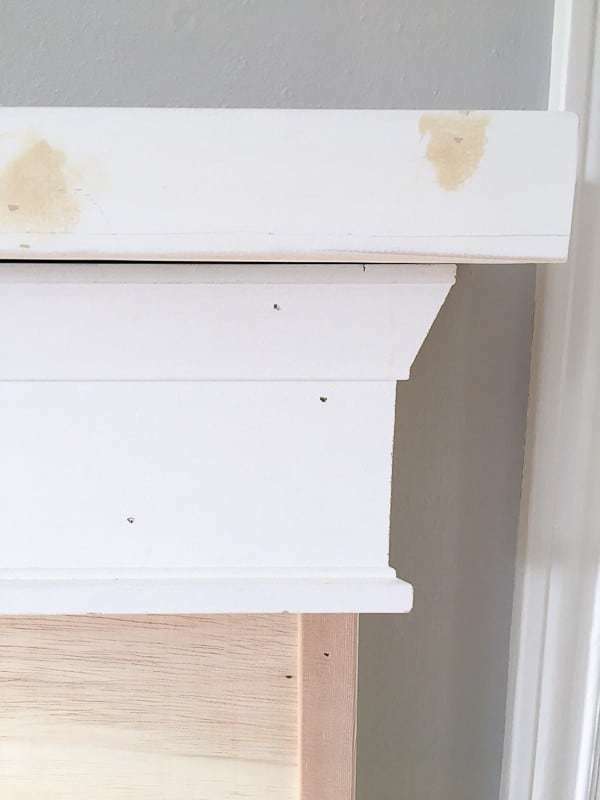 I didn’t want to remove the mantel and deal with all that drywall repair, so I decided to hide these imperfections instead. I had some 1/4″ plywood left over from prepping the fireplace surround, which I cut to the dimensions of the top of the mantel. Then I marked the location of the brackets on the plywood and cut out notches with my jigsaw. Another piece of plywood of the same dimensions went on top, completely hiding the bracket. To cover the plywood edges and create a deeper mantel, I used a pre-primed 1×2 to wrap around the original mantel. 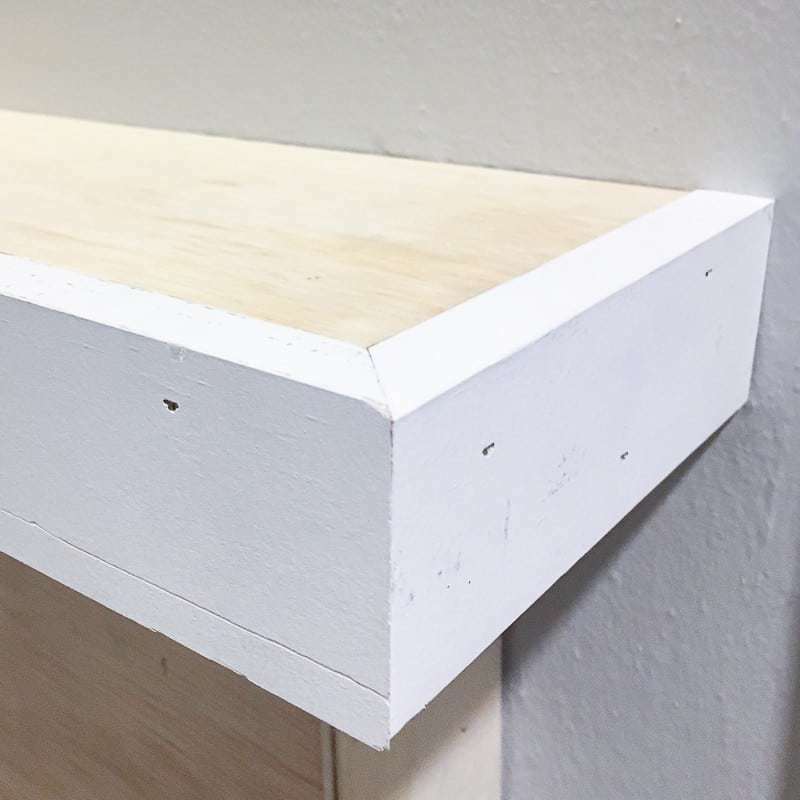 The gaps between the 1×2 and the plywood were filled in with wood filler for a seamless look. With the mantel fixed, it was time to make it pretty! 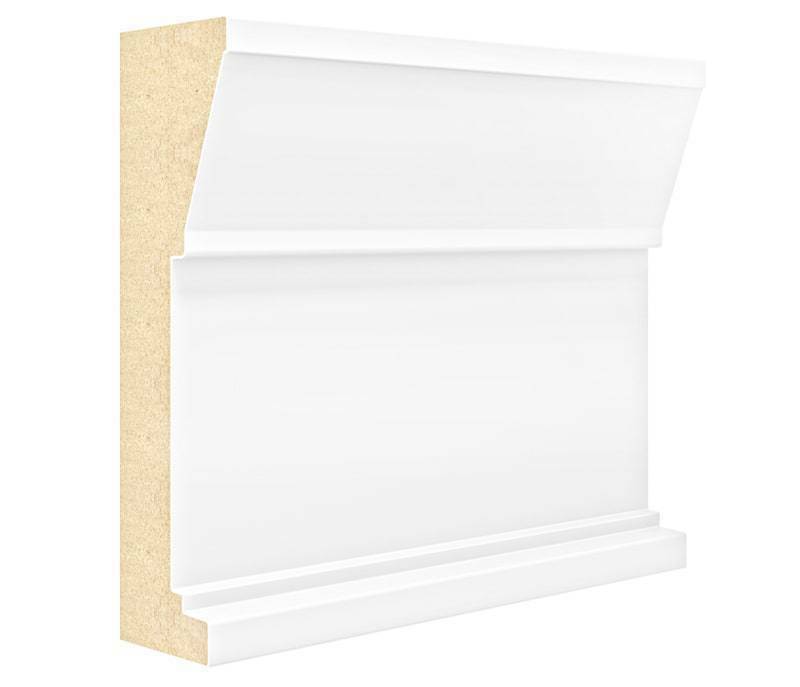 Usually, you would install crown moulding under the mantel, but I wanted something a little different for this narrow space. 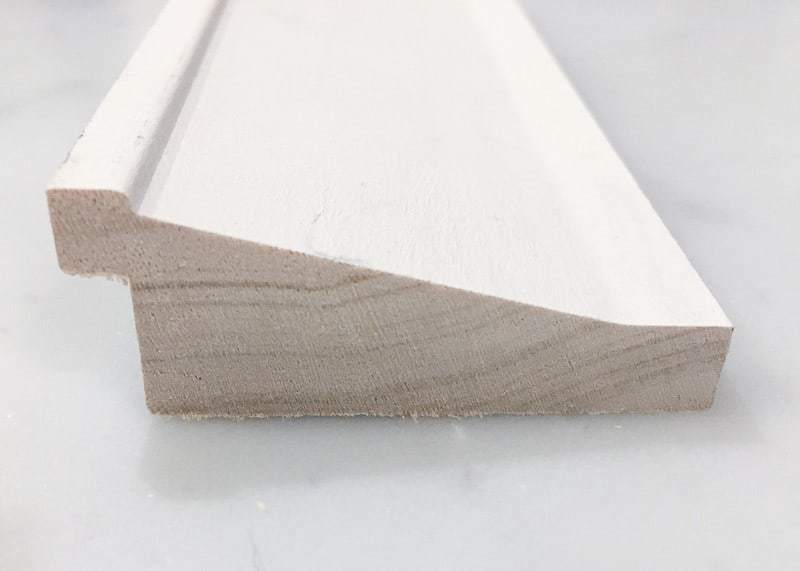 Metrie offers a variety of architrave moulding pieces, which are typically used as a decorative element on top of windows and doors. 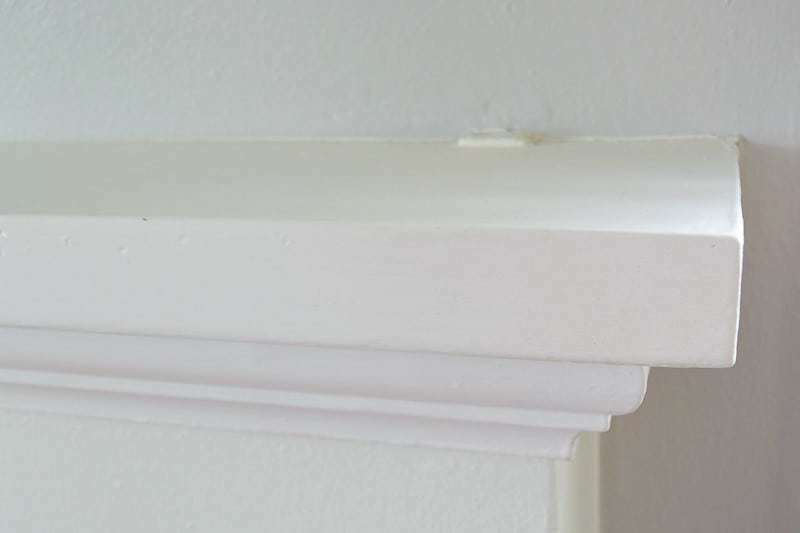 But the measurements of the Very Square 6 1/2″ architrave were absolutely perfect under our 3″ mantel overhang. This thick, solid architrave is really heavy! For added strength, I applied Liquid Nails to the back before I nailed into place at the studs. It rests on top of the corner guard trim I added to the outer corners of the fireplace surround. 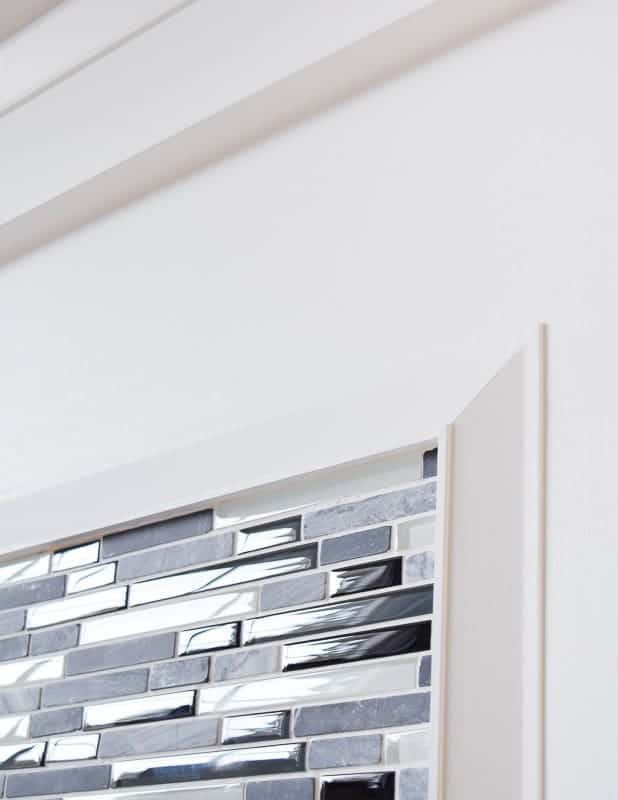 To frame the tile on the fireplace surround, I used one of Metrie’s wainscot moulding pieces. 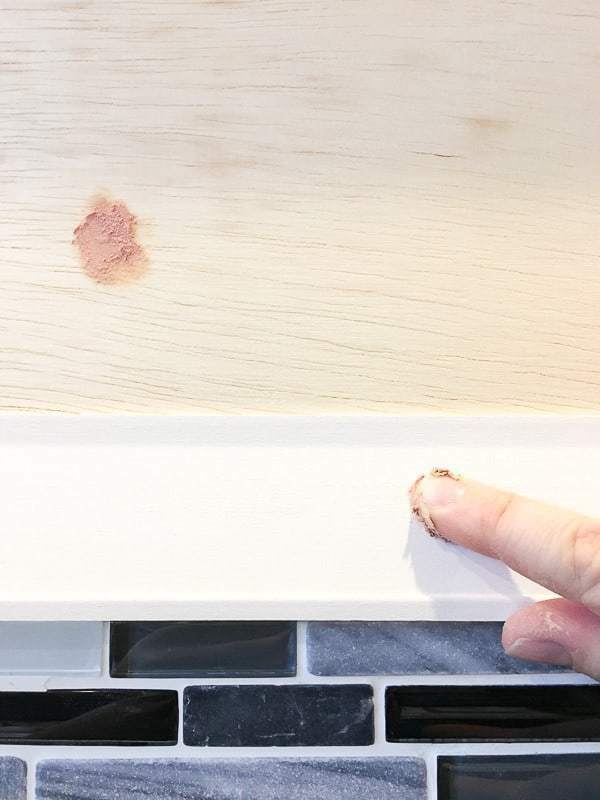 The little notch on the back is perfect for covering up any imperfections in the cut tile edges. 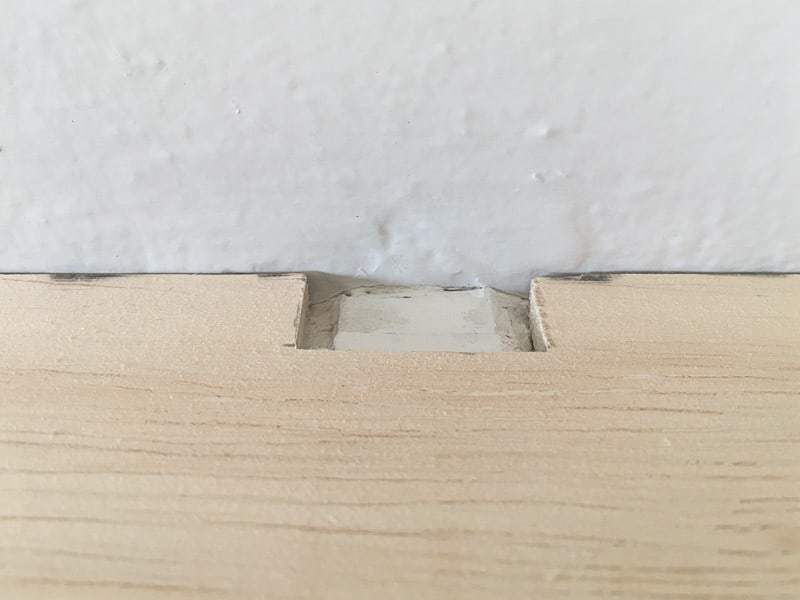 I needed to cut 1/4″ off the back of the wainscot moulding to match the height of the tile. But because the trim is angled, I couldn’t just line it up with the table saw fence and cut away! My dad suggested attaching a piece of the same trim to the table saw fence with double-sided tape to use as a spacer. 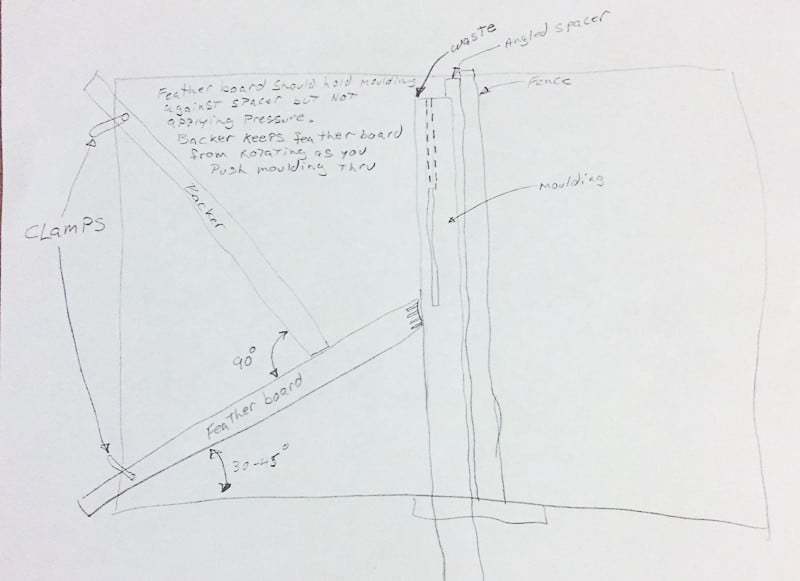 The two angles would nest together and create a 90 degree angle at the saw blade. I know, it didn’t make sense to me either. Luckily, he texted me a drawing! 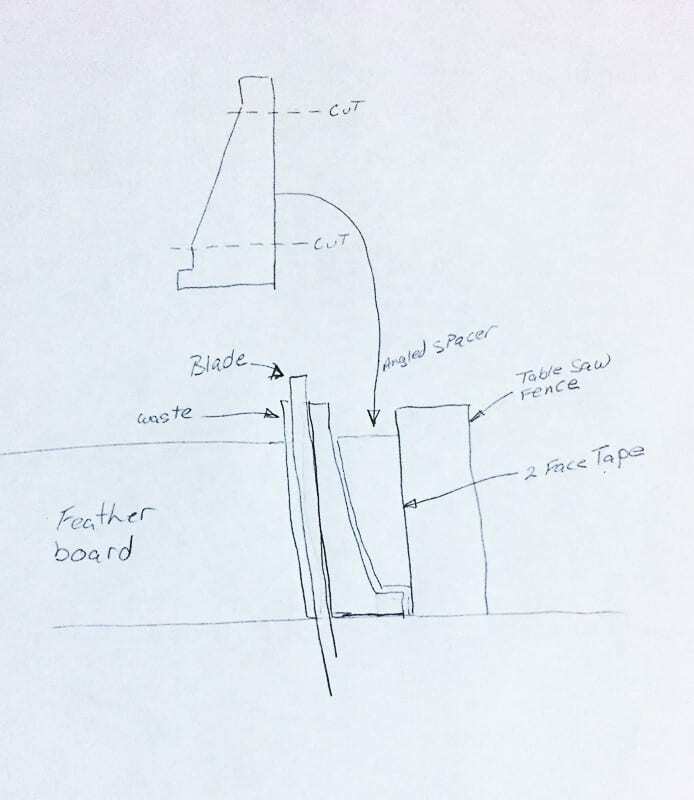 He also sent me a drawing of how to properly set up a featherboard, which holds the cut side of the trim in place as it goes past the blade. It worked like a charm! Now the trim edge floats just above the tile surround, and the remaining gap will be filled with caulk. 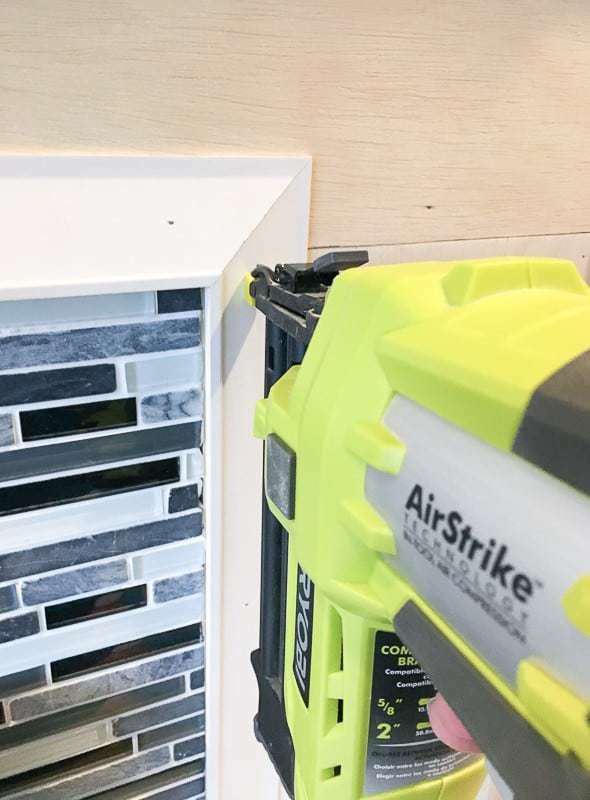 I mitered the corners and attached it with my Ryobi Airstrike brad nailer. 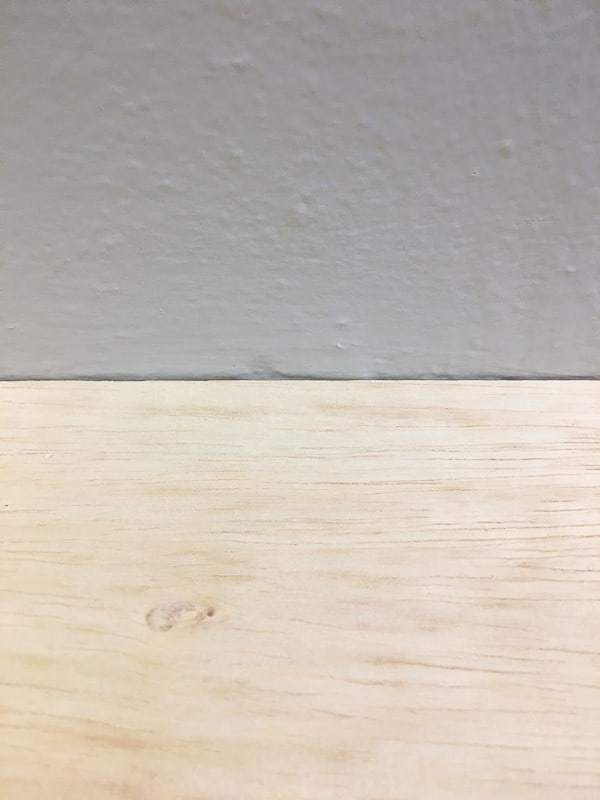 The nail holes were covered with wood filler and then sanded smooth. 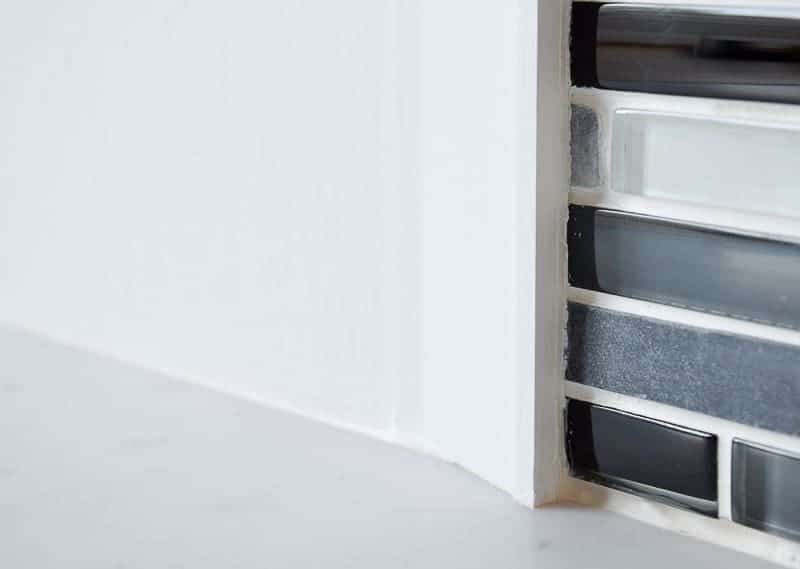 I used tile caulk that matched the grout for any areas where the fireplace trim and the tile meet. The rest of the joints received regular caulk. And finally, a few coats of primer and white paint worked their magic to bring the whole look together! I’m beyond ecstatic about how my fireplace trim turned out! It really transformed this project and tied all the elements together. 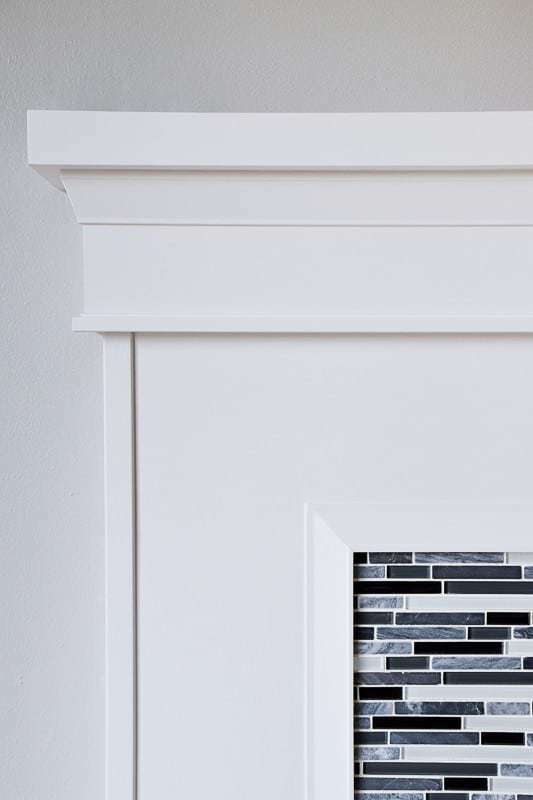 The fireplace now has a clean, yet classic look that will stand the test of time. I cut it pretty close, but I managed to get my fireplace remodel finished just in time for Santa to come down the chimney! I’ll be frantically decorating over the next few days, and will bring you the final reveal photos just in time for Christmas. Vi neta it’s been pretty fun to follow your fireplace Reno! It looks amazing. Pat yourself on the back my friend! Thanks Janice! I’m so glad it’s done! That looks beautiful, great choices! Beautifully trimmed mantel! Thanks for linking up with Funtastic Friday! This is great to save money you could spend on repairs. I love this article even more bc I like to take care of these type of things at home. Great stuff, Vineta. I stumbled upon this randomly while searching for some things on google. I don’ t know if it was your intention, but this looks very minimalistic. Again, awesome job! The trim looks fantastic! Well done. This looks great! I’ve been thinking of making my mantle wider and this has inspired me! Thank you for sharing on Merry Monday! Hope to see ya next week! It’s amazing at what adding trim to a fireplace can do!! Thanks for sharing with SYC.